We have the opportunity to demonstrate the robot and our team at a Local Seminar. I would love to have several members there. It is a school excused absence. Please let me know by email or teamsnap whether you plan to go. You will need the form below returned asap. The plan is to leave school around 7:15, demo and eat lunch there, returning to school around 2p. There should be no cost associated with the trip. We have concession stand next week. 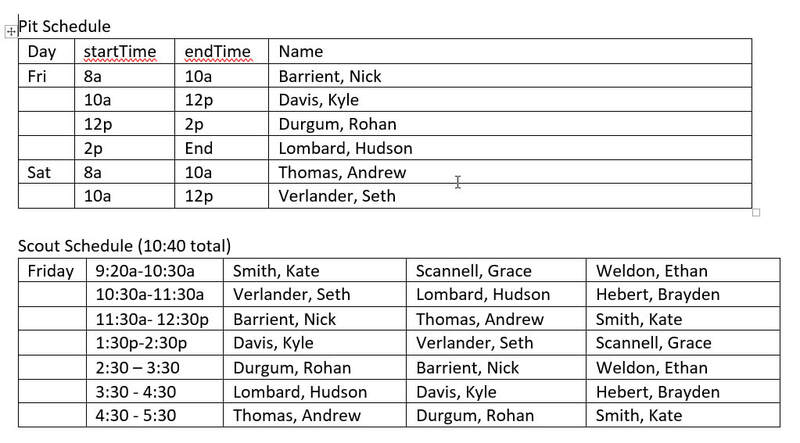 Here is your assigned times. Transportation: I've reserved a bus, but that could change based on attendance. 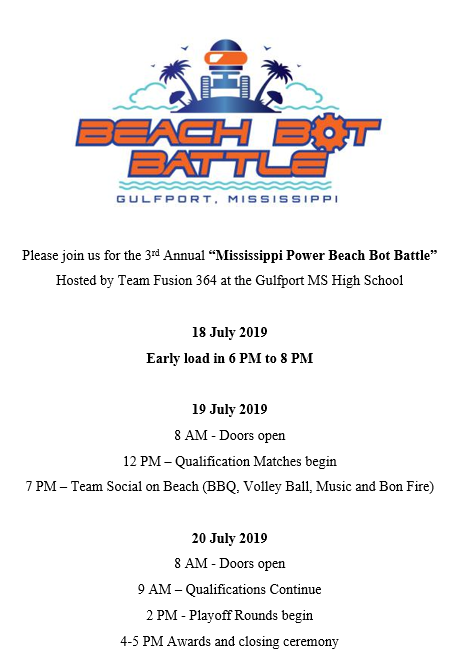 What: Off-season event where we compete for fun! The Pit and Scout Schedule is shown below. Leave PBS around 06:30am on Thr 3/21 in a school bus. Return to PBS ~7:30pm Saturday. CLOSED toe shoes. No-one is allowed in the pit area with open toe shoes. Students are encourage to bring evening snacks for the hotel. You will also need the field trip form below. ​1. You MUST fill out and return the form below to be on the team. You will not be allowed in the build area or team events without it starting 2018-Dec-11. 2. You must fill out the form here to attend official FIRST events including kickoff. Money? : The team covers the entrance fee and there is no transportation costs. Students should bring money to buy concessions for lunch and snacks. We will meet AT Woodlawn HS at 7:30am. The competition will run till 5pm or so. Then I plan to stay with whoever can to help tear down the field. Thank you for considering BulahBots! We are excited about the coming season. You will need to turn in the following form in order to apply for membership. Alumni: I have invited co2018 alumni to attend to HELP as mentors. ~9:30 BulahBots arrive and help with field setup. 1 PM to 6 PM team load in and practice matches. 6 PM to 10 PM Team Social: beach BBQ, bonfire, and volleyball. Saturday; Bring breakfast snacks if you wish. Room should have microwave. Saturday Lunch: Team bought bulk. Canes? more pizza? SNACKS: I suggest bringing snacks. However, there will be concessions. 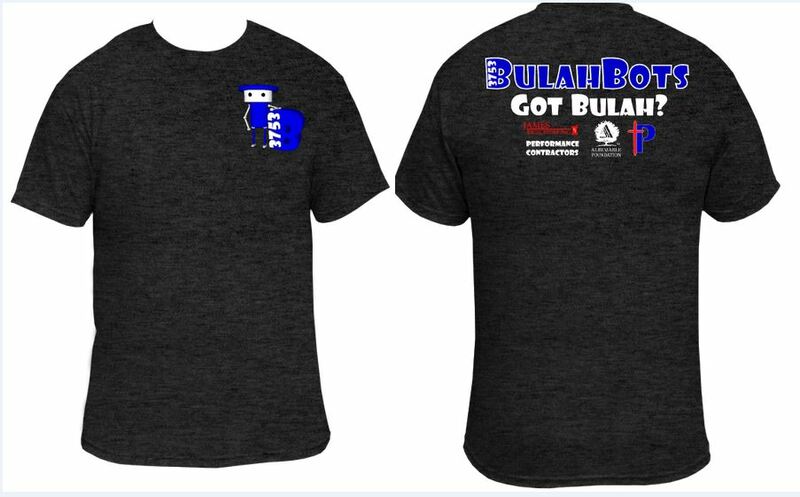 If you only have one BulahBots shirt, wear it saturday. I would prefer you not wear 'athletic' shorts. Remember, you MUST wear closed toed shoes. We're only staying one night, so don't overpack. We are participating in the Festival De Robotique this year. It will be downtown Baton Rouge, LA at the Capital Park Event Center. This is a casual 'competition' that is more of a demonstration for the area and lawmakers. ​7:15 Leave PBS parking lot with trailer. We will need to unload the trailer quickly, Please don't be late. Those who have an exam. Mr Wilmot (faculty) and Ms Wheldon (team mom) have offered to drive to the event after the history exam is over. You must Fill out and return the permission slip indicating that this transportation is ok.
After the competition we will help to take down the field. This event doesn't have a lot of volunteers like bayou or worlds. Please try to stay until we are done taking down and packing the field up. We will transport those who ride down there with us back to pbs unless told otherwise. 10:00AM Teams Begin Play in FRC, FTC, and FLL. 6:00 - 8:00PM Teams Pack-Up and Field Cleanup. This is a preliminary schedule and subject to change! Right now we are on Carver Subdivision. Our detailed schedule should appear 'click here' once it is official. There will hundreds of teams competing in our division (FRC). In addition hundreds of teams in each of the FTC, FLL, and Jr FLL divisions. All from dozens of different countries! This is a HUGE event. It takes place in the Brown Convention Center AND Minute Maid Park. Team t-shirts (i have some extras for rookies) or PBS t-shirts. I'll hand this form out at meetings or you may come get it from me in tech. Most meals will be concession stands, casual dining, etc. I may also do some group meals (pizza). I'm hoping that breakfast will be provided by the hotel. My usual Mentors may or may not be available. We take our pit to competitions in the team trailer. I will be driving the bus, so that possibly leaves us without someone to pull the trailer. Attire: Team t-shirt and Blue jeans approved for 1-3 hours and trip. FIRST Consent and Release Agreement: Listed below under "First Inspires Form"
This form must be filled out and signed by parent and student. This event has a three-fold purpose. It's primary purpose is so that those in the Senate and House can have the opportunity to see the awesome programs that FIRST provides. We are going to have FLL, FTC, and FRC teams present and you can expect to have a lot of VIPs circulating through the pits and watching the games, especially during lunch (11AM - 1PM) and after the session is over in the Capitol (5PM - 6PM). All teams that participated in the World Championship in Houston will be recognized with a formal resolution in the House during the day. I'm not sure when this will occur yet, but we are going to be asking those teams to have a few members available to be recognized. We are also coming to have fun. While this is a scrimmage, we will have official refs, an official score-keeper, FTAs, queuing - all of the things that you'd expect with an awesome off-season event. Our FTC and FLL teams will both have a full field of their own setup to show off their bots and I'm expecting that we will have a lot of excitement throughout the day. We haven't made a decision as to how we will play the final matches. Please be flexible as we go into the event and remember the primary purpose. The event is being held at the State Capitol Welcome Center located at 702 River Rd, Baton Rouge, LA 70802. This is not the Capitol proper but a building that is close by. Parking for the event is located all around the Welcome Center but the easiest vehicle parking is located across River Road from the Welcome Center. Teams can either load in on the morning of the 25th or after 5PM on the 24th. Please let me know if you'd like to load in on the 24th. *Please note that there are a few details to hammer out with the schedule that I will be sending out by Monday. We currently have 13 teams that will be attending the event. We should have enough space for each team to have a full 10X10 pit. Note that while the games are being played on a full-field outside under a tent, pits are being housed in the Welcome Center along with the FLL and FTC fields. We will be playing using the official game rules as of the World Championship though some penalties may not be called as strictly. With only 13 teams, we are going to be adding a few minutes in between matches to allow teams to change batteries and the like. You may be playing back to back matches from time to time - bring enough batteries with this in mind. Because this is a free scrimmage, we are asking that all teams assist us in volunteer roles throughout the day. We are asking that each team provide one or two people to act as ambassadors throughout the day. These ambassadors will be asked to show VIPs around and to be present during lunch to sit with Senators and Representatives to tell them about the importance of FIRST to the lives of students and mentors alike. Secondarily, we are going to be trying something new. At the end of each match, we are asking for two people from the drive teams that just played to help reset the field. This way we can have matches move smoothly. While food-trucks will be available to provide us wonderful food for free, we will not be eating lunch until 1PM so that we don't overwhelm the trucks and slow down the ability of the Senators and Representatives to get lunch and get back to the Capitol. With this in mind, you may want to bring snacks, drinks, and the like. Also - bring plenty of water as I'm sure we will be spending a good amount of time outside. Evening: We will be going out to eat in the evenings. Students may wish to bring a change of clothes. Please keep this appropriate. Personal Items: We will be staying in a hotel. Students should bring personal items. You will not have access to storage at competition. So please do not plan on bringing a heavy bag (books, computers, ipads, etc) that you might be tempted to set down somewhere. You are welcome to bring these items for use at the hotel. Students should bring money for snacks, Dinner on Friday, and Dinner on Saturday. We are also requesting that students bring $20 to help offset the cost of dinner/entertainment on Thursday night. We have no plans for breakfast. If you are a breakfast person, I would recommend breakfast bars or similar. The hotel does have a restaurant attached. Thursday night the team is travelling to Dave and Busters for entertainment and meal. This turned out to be more expensive than expected so we are asking team members to bring $20 to help offset that. Friday night we plan to go to the mall and students will need to buy their own meals in the food court. Saturday night we will stop and a fast food place on the way home and students will need to bring cash to cover that. Lunch will be provided daily and will be pizza or similar. NOTICE! THERE IS A CHANCE THAT WEATHER WILL AFFECT THIS EVENT. PLEASE PAY ATTENTION TO TEXT AND EMAIL FOR UPDATES. Make sure you have filled out and returned the team "Member Form" (HERE). Make sure you have registered with FIRST Robitics on http://usfirst.org. For the uninitiated, this is like an athlete registering for LHSAA. You are required to register before you can attend FIRST events, including kickoff. NOTE: AS OF NOW, I ONLY HAVE ONE STUDENT REGISTERED. Main Plan: Please attempt to do this online. It makes the paperwork so much easier for me. There are a couple of steps and your parent must get involved. Backup Plan: Paper form If you can't get the online form to work, Please come see me and i'll help. Failing that please printout the form and have it signed so we can get you into kickoff. 7:30 Leave PBS on a school bus and drive to LSU Digital Media Center. 12:00 eat lunch (Pizza or equivelent.... Any parent willing to bring this to school? Team can pay, it would just be convenient to have it there. Note: As far as i can tell there is no lone-star in Houston this year. Lunch: is yet to be decided. Most likely, we will be providing some cash to help them buy lunch in the concession stand. Snacks: are on their own and will be mostly concession stand prices. Entrance if free. You are welcome to attend any or all of it. The most exciting will be Saturday after lunch. 5:00pm-6:00 check into hotel, get cleaned up. 7:15pm Arrive at PBS, get picked up by parents. Choi Touchet Luke Scannell Josh, D.
This is an important meeting. We are discussing the coming season! We are working the lunch-time concessions during the week of 11/10-11/14. I'm desperately looking for help to cover the middle school lunch shift which runs from 10:45-12:15. 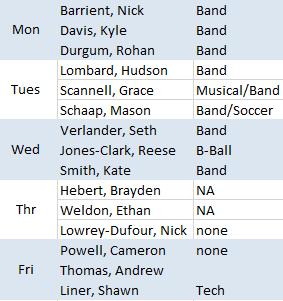 Below is the list of parents/helpers already signed up. We leave this coming Thursday for Bayou Regional. Here are some details for you. Students may wish to have money for bowling Friday night. 6:45am Bus leaves to Bayou Regional. 7:45-8:00 bus arrives at pontchartrain center. 5 reps load robot in and begin inspection process. 5:00ish Students report to rooms for showers/dressed etc. 7:45a students report for checkin. 7:30 load bus to bowling alley. 7:30pm Arrive PBS Please watch for texts from you students in case we leave early or late. The BulahBots! 2014 Team t-shirts will be ordered soon. 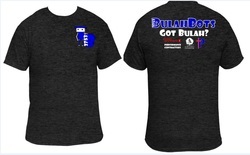 If you would like one, please email coach@bulahbots.com asap with your size. Each shirt will cost $20. Here's a link to the game video on youtube. We will be assisting with setup, tear down, safety, etc.